A fluent smooth graceful style, China’s Liu Gaoyang, followed by colleague Wen Jia and Germany’s Nina Mittelham, were the players to attract the attention as play commenced in the opening round of the Women’s Singles event at the Seamaster 2018 ITTF World Tour Asarel Bulgaria Open in Panagyurishte on Thursday 16th August. 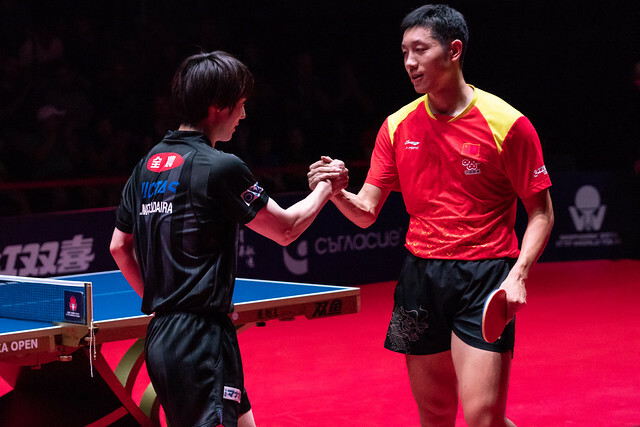 All three required to compete in the qualification tournament; all three trying to establish themselves amongst their country’s elite, all three upset the order of merit. Winner of the Girls’ Singles title at the 2010 ITTF World Cadet Challenge in San Juan, Puerto Rico, more notably four years later gold medallist at the Nanjing 2014 Youth Olympic Games but yet establish herself amongst China’s elite, Liu Gaoyang emerged successful in the closest contest of the round to date. She beat Japan’s Miu Kato, the no.7 seed, by the very narrowest of decisions (4-11, 12-10, 9-11, 11-5, 5-11, 5-11, 11-7, 11-9). A close call for Liu Gaoyang, for Wen Jia, in a not too dissimilar situation to Liu Gaoyuan, she accounted for Romania’s Elizabeta Samara, the no.9 seed (8-11, 11-3, 12-10, 12-10, 11-9). Notably Wen Jia was a silver medallist in the Girls’ Singles event at the 2006 World Junior Championships in Cairo, later the winner on the ITTF World Tour in 2011 in Shenzhen then two years later in Bremen. Equally, for Nina Mittelham, the winner of the Cadet Girls’ Singles title at the 2011 European Youth Championships, establishing herself at senior level is the next step; she accounted for Sweden’s Matilda Ekholm, the no.11 seed (11-8, 11-7, 6-11, 8-11, 11-8, 12-10). Defeat for three seeded players as the Women’s Singles event commenced, there was also defeat for one more; the host nation’s Maria Yovkova, the no.16 seed, she was beaten by Italy’s Li Xiang (11-3, 11-2, 11-2, 11-3). Otherwise in the top half of the draw it was success for the seeded players. Japan’s Kasumi Ishikawa, the top seed, beat Britt Eerland of the Netherlands (11-8, 11-4, 11-4, 11-6), colleague, Miu Hirano, the no.3 seed, overcame the defensive skills of Russia’s Polina Mikhailova (11-7, 11-4, 11-9, 11-7). Likewise, Romania’s Bernadette Szocs, the no.12 seed, defeated Japan’s Maki Shiomi (9-11, 11-7, 15-13, 4-11, 11-6, 11-8); most pertinently, China’s Ding Ning ended the hopes of colleague, Zhang Rui (11-6, 11-4, 15-13, 11-6). The lower half of the draw will be completed later in the day.